My six year old son is going to go crazy over this recipe. He loves spaghetti and can eat it like a grown man. I have never seen a child eat so much. This is a SUPER EASY recipe. The hardest part is waiting for the Rhodes Bread Loaf to thaw. I will add some meat to my sauce because we like our sauce a little chunkier with meat. Plus, I really like Prego's Traditional Spaghetti Sauce. 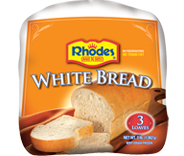 I found this recipe on Rhodes Bread. I use their rolls all the time. They are amazing. I have never used the bread loaf so I am excited to try this. I have no doubt it will be just as good as all the other Rhodes rolls I have made. This is a great go to family meal and I can't wait to make it. I will be doubling the recipe as well. The picture tutorial below will show you just how easy it really is! Cook spaghetti according to package instructions. Drain and let cool slightly. Remove wrap from dough. Place spaghetti lengthwise in a 4-inch strip down center of dough. Top with sauce and cheese cubes. Make cuts 1 1/2-inches apart on long sides of dough to within 1/2-inch of filling. Begin braid by folding top and bottom strips toward filling. Then braid strips left over right, right over left. Finish by pulling last strip over and tucking under braid. Lift braid with both hands and place on a large, sprayed baking sheet. Brush with egg white and sprinkle with Parmesan cheese and parsley. Bake at 350 degree s for 30-35 minutes or until golden brown. Cool slightly and slice to serve. One thing about writing a food blog is you see these delicious recipes and it makes you hungry! I am starving right now and I want this! I always have to have a side of ranch dressing with everything and it is going to be soooooo delicious with this. Let me know if you make it and how you like it. I just tried this last night. My daughter, who loves to take leftover spaghetti and put it between two slices of bread, was very excited. It did turn out quite well, although mine was no where near as pretty as yours! Things I need to remember next time: Add more spaghetti to the bread. I conserved and ended up with 'too much' bread on the top. Secondly, I think I will brush it with garlic butter before putting the spaghetti down and braiding it. Just a thought. A wonderful presentation of a classic dish. I look forward to doing it again! Haan Select Variable Steam Cleaner Giveaway! Oriental Chicken Salad - A league of its own. Scoop Nachos with Worlds Greatest Salsa Ever!